Hi there. I’m Becca (@BookishBecca to those of you on Twitter!) and like you (if you’re taking the time to read this) I’m rather obsessed with all things ‘vintage’. I was thrilled to be this month’s Finder. Unfortunately, my day job does not include vintage, but I do live my life as though I were living in the mid 20th century, clothes and homewares included! My other half likes to joke that he feels as though he is in Quantum Leap and expects to wake up one day and find himself back in another decade. (He loves it really and never misses The Vintage Village). 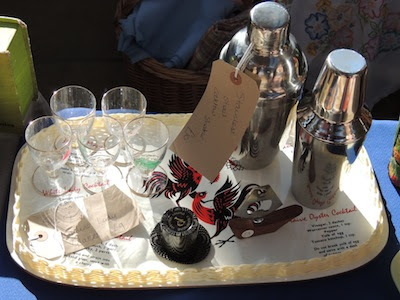 My love of vintage has been simmering along for about 15 years or more now but has been fuelled further by the availability of more fairs and shops than ever now. 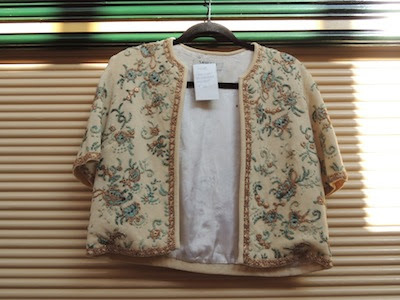 I should credit a number of factors for encouraging my love of vintage: growing up in ‘hand-me-downs’(! ), studying history of fashion and making ball gowns each year at school (this certainly comes in handy when dating items) and adoring my grandmother’s sense of style (she was a much travelled licensee who was ahead of her time and always impeccably dressed – wearing trouser suits long before it was socially acceptable!). I’d receive beautiful antique gifts every birthday and Christmas from a dear family friend too (a chair to match my grandmother’s bureau, a 1930s Liberty silver toast rack, and silver coffee spoons); this led to trips to antiques fairs, which I enjoyed more and more as mid century items started to become more and more available. I’ve always adored reading and now at Hay festival every year I spend hours collecting old mini Everyman hardbacks. I think it’s a combination of the stories themselves & imagining which page the previous owner turned to oftenest that made me fall in love with old books, so much so that I can rarely bring myself to buy a new book. Lastly, like every good vintage lover, I enjoy watching old films, and love the fact that The Vintage Village shows a different one regularly now! I did get a little bit obsessed with Mad Men (before it was ‘cool’) and The Hour on BBC 2. 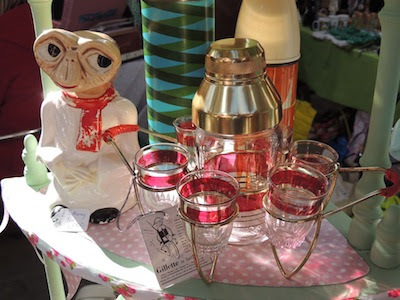 Twitter has only aided and abetted the whole thing, introducing me to other stall holders and fellow vintage lovers; many people think my love of vintage is just odd but meeting like minded people is wonderful! I love coming to The Vintage Village each month for a chance to wear your best vintage outfit (not having to tone it down for work) and meet vintage friends. My family have always said I was born in the wrong era! Right then, are you still there? This was a challenge, as, true to form I wanted to buy everything and had to be dragged away at the end, being reminded that I was going to struggle to fit it all in my little (vintage!) Figaro. This jacket is absolutely beautiful; I’ve seen it a couple of times before and every time I resist because I think it’s too early into my shopping trip, and wonder when I’d have an occasion to wear it. If it’s there next time, I’m trying it on and buying it – you can hold me to that! 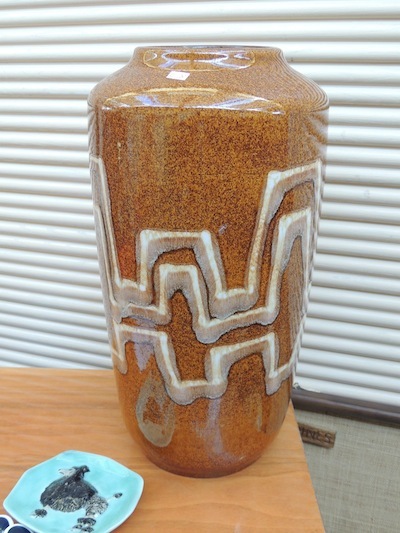 I loved this vase as it reminded me so much of some of my Nannie’s vases that she used to have in the hallway. She had a lot of tall vases, probably to display my Grandad’s price winning chrysanthemums in! I’m always drawn to all things bar related, which might seem strange considering I hardly ever drink, but I used to love working as a barmaid during university, and my granddad and uncle used to enter all sorts of cocktail making competitions in the USA and do rather well! I had a cocktail named after me & entered in a competition when I was born apparently. I resisted taking more drinks items home to fill my already bursting display cabinet, but did grab a vintage ‘arm tray’ for the arm of my sofa! 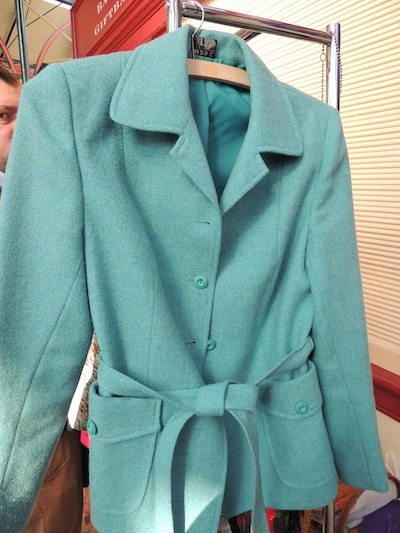 This beautiful all wool jacket was a bargain, and a perfect fit, AND my favourite colour (I should have taken a picture of me trying it on sorry!) The stall-holder and her mum were so lovely and helpful with some really good quality items of clothing and some amazing shoes. I will definitely be going back again next time. Yes, more cocktail stuff! This was just amazing, but I think the childhood obsession with E.T. can be partly blamed for this find too. I was spoiled for choice on this beautiful stall; it really stood out. I bought a lovely little old Oxo tin for £2 and a sugar bowl and jug for £4 from the same stall. I have always loved collecting sugar bowls, but seem to have amassed quite a collection of old tins lately too. I took home a couple of tins yesterday! Thank you for indulging me and hope you liked one or two of my ‘finds’ as much as me! See you next month. [Editor back again now] Thank you Becca for assembling such a fabulous array of vintage wantables! There really is something for everybody here! 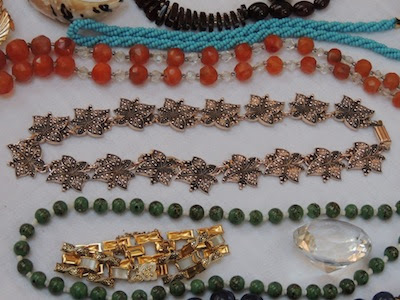 I am rather a magpie when it comes to Vintage ‘pretties’ (as I call them!) This necklace is perfect for Autumn with its pretty leaf pattern. I clocked this vintage tie press before I’d got both feet through the door. 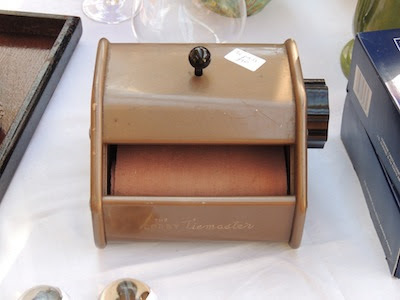 I’d never seen one before, and the stall-holder was kind enough to show us this in action. Stand back, as the tie shoots out at some speed! It seems that, unlike the trouser press, the tie press never quite caught on. I can imagine Roger Sterling from Mad Men or Hector from The Hour using one of these. 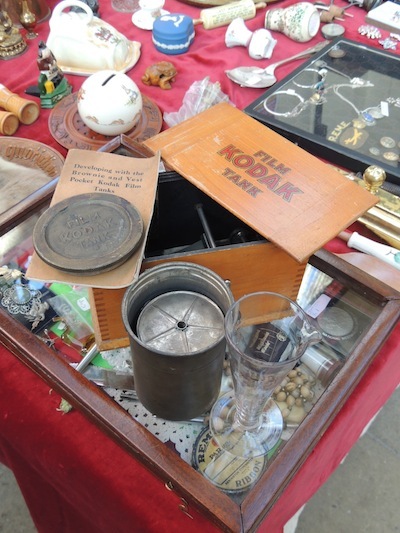 I loved this and was sorely tempted to buy this for my Dad; when I was growing up my Dad was a photographer before he worked for Kodak full time in the 80s. Many a weekend would be spent at my Nannie’s house developing pictures in our makeshift dark room, shouting to my sister when she was allowed to open the door! I have been looking for a nice one of these for ages; this one came with its original key too. It’s in beautiful condition and will most definitely be getting a lot of use with all of my products! 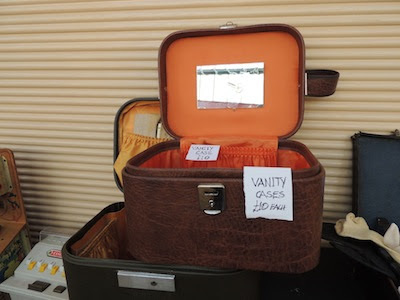 This stall had tons of gorgeous sewing paraphernalia at very reasonable prices, and the most amazing sewing chest, which I must have asked if it’s for sale about 8 times now! 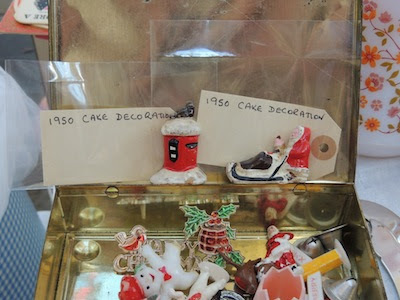 If anyone has any vintage decorations or anything Christmassy, that you want to sell then feel free to tweet me! 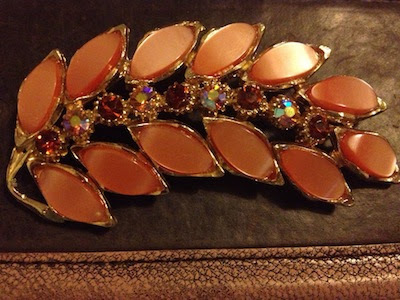 I have far too many brooches, but as I’m a bit of a magpie, I couldn’t resist this peach one. I have lots of blues and turquoises, but not peach; that’s my justification and I’m sticking to it! 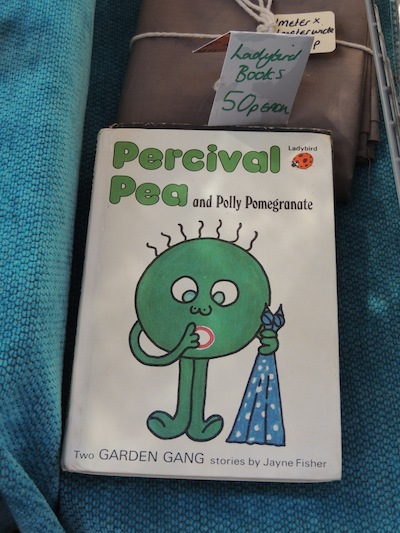 I couldn’t resist taking a picture of this little book; I had all of the Garden Gang books as a child and spent great care drawing all of the characters. I couldn’t believe it when I saw this, but I did feel rather old! This stall does a lot of great 70s-80s children’s items; I spotted a Muppets drum too and last time, bought a Paddington cushion made from the same fabric I had as a duvet years ago! Lastly, my favourite stall! 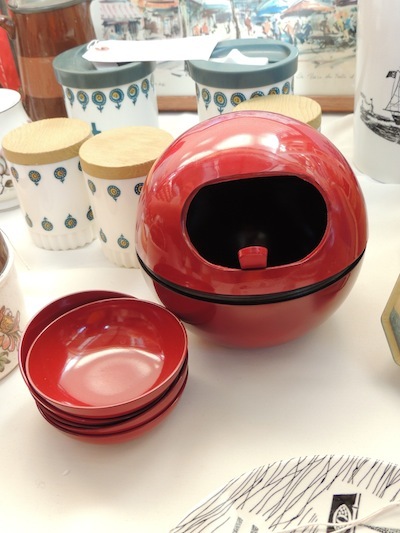 Sue has some amazingly well-priced homewares that I love and always has something that I’ve never seen before. Although I took away a 50s duck egg blue coffee set, it was the cool retro design of the snack server that I had to capture as my last Find.